Joe Paradiso, an associate professor at MIT's Media Lab and director of the Responsive Environments group, started building this analog music synthesizer in 1973. Now, it streams music live from the MIT Museum, and users can manipulate it remotely via the web. With ten people at a time fiddling with the machine's knobs and switches (literally -- the web interface controls the synth's motorized parts), the music often sounds a little like a chorus of baby UFOs getting rowdy. The chaos of collective control is pure fun -- dial down the tempo to turn the bleeps and echoes to syrup, only to see someone dial it way up to frenetic levels again. Someone hits the "slapback drum machine" button just as you hit "growl + gliding & rumbling," and texture builds on texture. Visit http://synth.media.mit.edu/patchwerk/ and enter a username to get in line to participate. It was a time, [Paradiso] says, when information and parts for do-it-yourself projects were scarce, and digital synthesizer production was on the rise. But, he decided to tackle the project — without any formal training ... Paradiso gathered information from manufacturers’ data sheets and hobbyist magazines he found in public libraries. He taught himself basic electronics, scrounged for parts from surplus stores and spent a decade and a half building modules and hacking consumer keyboards to create the synth, which he completed in the 1980s. 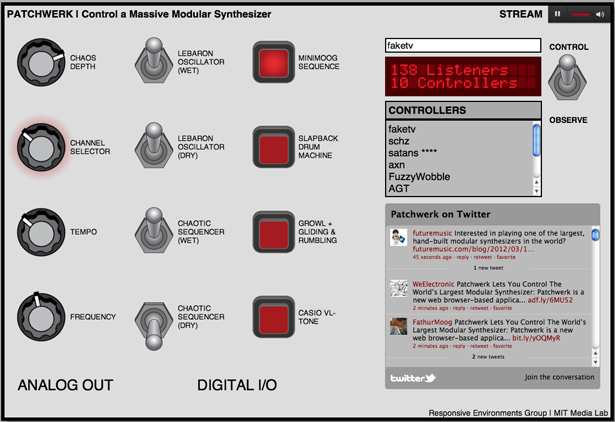 For more information about the Paradiso Synthesizer, visit http://web.media.mit.edu/~joep/synth.html.